Coming up in future weeks we're going to be talking about a seemingly basic question, "What is the Gospel?" But before we get into that, and as kind of a set-up for it, we're going to spend a couple of weeks talking about some of the differences between Old Covenant and the New Covenant. In the Old Testament, Jeremiah (and other OT prophets and authors) looks ahead to the coming of a new covenant, which came in as a result of what happened on the Cross. 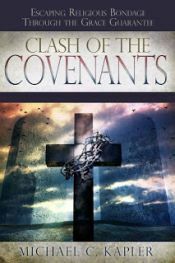 In the New Testament, the book of Hebrews (and other NT books and authors) looks back to the Cross and speaks of this New Covenant, which it calls "a better covenant, established on better promises." We'll talk about how both Jeremiah and Hebrews establish the fact that there was a problem with the Old Covenant. In short, the problem was that the people couldn't (and didn't) keep it! So a new covenant was needed that wasn't based at all upon mankind keeping it and that wasn't based upon anyone's behavior or law-keeping.